Moschino will launch So Real Cheap & Chic, a new fragrance for women. So Real Cheap & Chic is a flanker to 1995's Cheap & Chic. The notes feature bitter orange, mandarin, raspberry and blackcurrant sorbet, peony, jasmine, magnolia, cedar, oak moss and ambroxan. 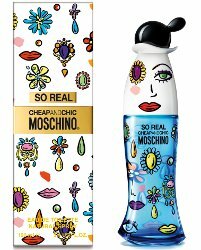 So Real Cheap & Chic Moschino will be available in 30, 50 and 100 ml Eau de Toilette and in matching body products. So tacky. Even for Moschino. I think it looks kind of fun. You know, fun-tacky. I do too — nice update of an already fun-tacky bottle. Sure, but how much will it cost? Is it as cheap as its name suggests? Umm, that bottle may give me nightmares tonight. I’m afraid it would wake up at night and chase me around the house with a butcher knife. I’m generally not dramatic, but sheesh!! It really creeps me out???? Oh gosh! I cannot stop laughing! I kind of like this line. The orange/green one was fun and strange and the original is nice. I’m always, always on the lookout for a nice blackcurrant scent so I will test this. At first glance, I thought that there were a bunch of amoebas crawling all over the bottle. Time to get new glasses, I guess. They do look amoeba-like :-). Maybe they’re amoeba disguised as things and body parts? I am going to a Halloween party and I may go as Cheap and Chic but it will be lost on my non-perfumista friends. A Cheap and Chic Halloween costume would definitely be something singular! I think it’s a cool idea.